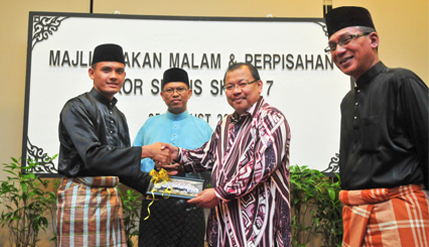 BANGI, 26 August 2014 – The National University of Malaysia’s (UKM) Undergraduate Police Volunteer Corp (SUKSIS), who have completed their training earned their ranks as inspectors today. A total of 51 of the 57 cadets including 31 girls from the Squad 7 graduating class attended the official ceremony held at University Technology Mara (UiTM) yesterday to receive their commissions. They were today feted to a farewell dinner at the Bangi–Putrajaya Hotel here where they were given their certificates. UKM Vice Chancellor Prof Datuk Dr Noor Azlan Ghazali, who is the SUKSIS Commandant presented their certificates at the dinner saying that he was proud of their achievement in getting their commissions. He hope they will continue to uphold their vows as part of the police force to uphold the law and serve the people while continuing their studies in UKM. He reminded those who will graduate later this year to re-evaluate their standings in life once they step foot out of campus and into the real world. “You must see, where you were when you first walked into UKM and where you are going once you graduated. You must know what your value is to the people. What do you bring that is different, that they will need so badly, that they must hire you.” Prof Noor Azlan said. He reminded those who are graduating that they will always be part of UKM and as UKM’s alumni they will always be attached to the university hoping that they will continue their relationship by contributing in whatever way to the university . Various commanding officers of the corps including Prof Dr Khaidzir bin Hj Ismail, the Deputy Commandant and Hj Musa bin Zainal Abidin, the Field Training Officer attended the dinner.